GFX Generators – Now that the sprites and palette selections are on different pages, I’ll be adding more of both to a few characters in this and future small updates. As a back-up to the Bravoman update, the full “Bravoman X Wonder Momo” cover set-up and logo was added to the “Comics 88×136 pixels” style. 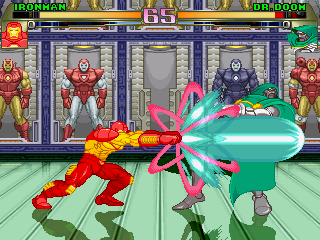 Custom Sprites – Four new Super-Skrull variations (Thing fist, Fantastic fist, Torch arms and 4 powers at the same time) were added to the Marvel page. Chomp Chomp, Pac-Man’s dog, was added to the Namco page. I’m going to be at the All AmeriCon convention in Warren, Ohio on July 7th. I made a Tumblr post about it here with more info and the Facebook (sorry) page for the event is here. Updates will be small until then because I need to get ready for this along with getting another website up and running. The next big update will be on July 19th, this website’s birthday. This site also has its own Twitter account now and you can keep up with updates from that, this site’s WP RSS feed or the site’s Tumblr that I linked to earlier. Pac-Man debuted in Japan on this day in 1980 and changed the world of video games. I’m old enough to have been alive and gaming when that coin-op machine hit the U.S. later that year and transmitted Pac-Man Fever to the point that even my grandmother liked the game. While those who tout story over gameplay still claim that gaming is still waiting for it’s “Wizard of Oz” moment, I’d argue that way parents introduce their young’uns to the dot-eating hero has become just as much of a tradition as being off to see the Wizard. To celebrate, I made a quick little sprite of Chomp-Chomp, the Pac-family dog as he appeared in the Ruby-Spears cartoon that went on to inspire later official Pac-games. He’ll be added to the GFX Generators in the small site update later this week. Comments Off on Happy Birthday, Pac-Man! There’s another update on the way some time this week, but I wanted to get Bravoman’s stuff on the site as early as possible to celebrate the 25th Anniversary of his game hitting Japanese arcades. Bravoman’s custom sprite was improved a bit more, his Japanese arcade logo and ShiftyLook logo were converted to mini-logos, his game was added to the Game Index and sprite from that game kick off his sprite gallery. Any of those things that could added to his character in the fighting game-sized GFX Generators were added along with the GroupShot getting a new “Comic 88 x 136” info layout based on the “Bravoman X Wonder Momo” cover by UDON. If you haven’t checked it out, be sure to hit ShiftyLook.com and check out Bravoman-related celebration there, including his new cartoon! 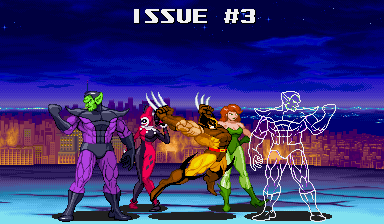 I’ll be back later this week with another small update, including more Super-Skrull sprites! … you won’t be able to tell from this small update. VsMaker: Added X-Men: CotA name graphics for more Marvel characters (and a few others). There’s an issue with player 2 characters and that screen, but it’ll require a new thing for the engines and that might be a while. Mini-Logos: Marvel Super Heroes – Secret Wars and X-Men vs. Street Fighter (Secret Files) added to Marvel section. Those logos were added to the GFX Generators and work nicely with their counterparts in the Comic 88 x 136 layout in the GroupShot generator. It’s the last of the comic book updates! This issue has a lot of Superman-related characters to celebrate the 75th Anniversary of his (and Lois’) first appearance. There will be another chunk of Superman sprites later this year to celebrate the 25th Anniversary of the arcade game by Taito. Custom Sprites – The sprites added to the generators have all been added to their respective Marvel, DC and Data East galleries. 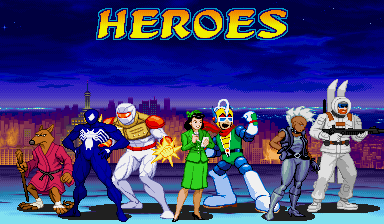 BTW: Data East’s Chelnov is celebrating its 25th anniversary so I thought it’d be nice if Data East’s superhero made his way into this update, too. That’s the end of comic book week for this year. All of the update posts from this week will be merged into a Trade Paperback post tomorrow so those who weren’t following can see all the newness at once. Thanks to everyone who checked out the new things here and extra thanks to anyone kind enough to repost or like these updates on the various places I posted them. Be sure to look at the other updates if this is your first time back, especially if you didn’t know about the new MUGEN stage I added on Thursday. 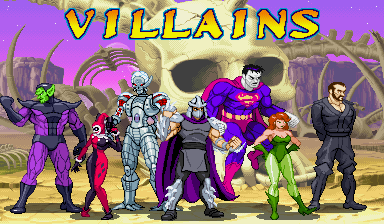 The site will be back to more game-related updates, but comic heroes and villains will be sprinkled in here and there, just as they’ve always been on this site. Have a good weekend! This is the third of this week’s comic book-themed updates timed with the release of Free Comic Book Day (which is tomorrow) along with Iron Man 3. As much as I planned to have much more done for today’s update, I had to put in extra hours at the day job and that cut down on production time. Hopefully the character selection will make up low character count (and tomorrow’s update will definitely make up for that). I also added an edited Wolverine sprite so he’ll have another in his orange and brown outfit. The new sprites won’t in the Custom Sprite galleries until tomorrow because I’m tired and a bit lazy. 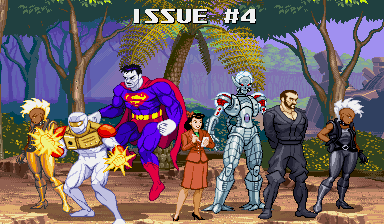 There will be another update on Saturday with more comic and super-related sprites, including the Lois Lane sprites you may have seen in a few other places. Here are links to the news posts for issue 1 and issue 2(New sprites of Splinter, Shredder, and more) (Bravoman sprite and Iron Man’s Hall of Armor for MUGEN). I think I’ve saved the best sprites for last, but that’s not my call. It’ll definitely be the most in one shot, though. One last thing: if you go to a comic shop for the special free comics, do your shop a favor and buy a few comics, too. The shop actually has to pay for those free comics and they’ll probably be swamped with soulless, grubby buttscrapes who’ll just get the free comics and leave. Buy something to help them out if they’re a good comic book with people who are nice to you. Don’t be a buttscrape, people.